Just before the seminal rockumentary The Last Waltz begins to unspool, you are famously advised that "This film should be played loud!" This is wise guidance you should follow when playing the JBL Link 500 Google Assistant speaker ($399.95). This bulky Bluetooth/Wi-Fi Google Assistant smart speaker is obviously no shrinking violet. It is not designed to provide a silky smooth seduction soundtrack or soporific new age lullabies for relaxing massages or nature noises to actually put you to sleep. The JBL Link 500 is meant to play loud, to annoy the neighbors or a snoozing roommate, to provide a pounding beat for hard partying. And that's okay, even if you also need a more subtle-sounding smart speaker. Given the growing gaggle of Google Assistant speakers, owning one that plays loud and another, such as the Google Home ($129), or the JBL Link 10 ($149.95), or the Onkyo G3 ($199), for other listening purposes in other locales, is a nice luxury to have. But for partying, I have yet to find another smart speaker as loud and as beat-laden as the JBL Link 500. Reserve a generous amount of stable tabletop space because the jet black Link 500 is bulky – yet is comparatively light. It measures 14.57 inches across, 7.87 inches tall and 6.18 inches deep, and weighs 7.72 pounds. By comparison, the Google Home Max ($399), the speaker closest in spirit to the Link 500, is slightly smaller – more than an inch less wide, almost a half inch shorter and slightly thinner, but at 11.7 pounds, nearly four pounds heavier, which means the Link 500 can be placed in, shall we say, less sturdier locations. Unfortunately, the JBL Link 500 isn't waterproof (and neither is the Google Home Max), which I find weird. It's clearly designed to produce a lot of beat-heavy sound, which would make it perfect for outdoor use, yet it is not immune from the elements. If you're going to use it on the patio or in the backyard, make sure you keep it away from a pool or dripping swimmers, and make sure to take it back inside after the party is over. If you need a Google Assistant smart speaker outdoor party pal you need JBL's smaller and IP67 dust- and waterproof Link 20 with its 10-hour battery life, or wait until the Altec-Lansing GVA3 Go Live-To-Go ($149.99) speaker with IP67 protection and six-hour battery life goes on sale at the end of May. Atop the JBL Link 500 are six physical tap controls: from left-to-right, a Bluetooth pairing button, mute/unmute, Google Assistant activation (instead of uttering the trigger phrases), volume down, volume up and an all-purpose play/pause/stop/timer set/alarm set button, along with two microphones. Thankfully there's no bulky transformer, just a simple detachable AC cord. Unfortunately, the JBL Link 500 lacks accessory jacks – there's no auxiliary to physically connect a media player. More surprisingly for an AC-only powered speaker, the speaker also lacks a USB jack to charge your phone, both of which the Google Home Max include. There is a microUSB jack labeled "Service," the use of which is a mystery, and I didn't have a microUSB-to-microUSB jack to test charge an Android phone. There also is no manual or quick start guide of any kind in the box with Link 500. (I guess JBL figures you know what to do.) The Quick Start Guide available on the JBL web site is nothing more than a product diagram and a spec sheet. 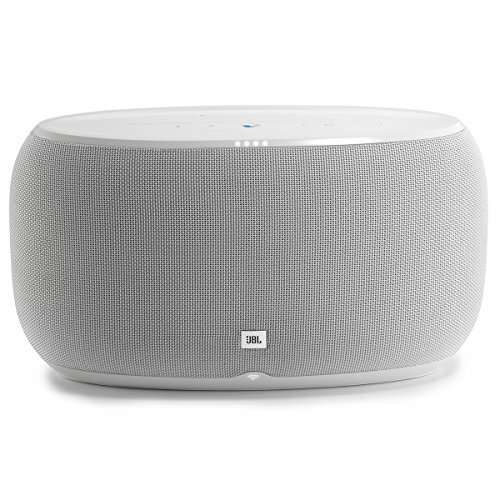 Just in case you don't know how to get started with the JBL Link 500, you need to download the Google Home app, and not the separate Google Assistant app. (At some point, Google will combine these two apps, the dual existence of which serves no purpose except user confusion). You plug in the JBL Link 500 into AC, it tells you to download the app, and four white dot LEDs fade on and off in sequence as if awaiting for further instructions. Next, open up the Google Home app, and the JBL Link 500 will pop-up, ready to set-up. Here's a great part of the set-up: the speaker identifies the correct Wi-Fi network to connect to, grabbing the network name and password from your phone so you don't have to enter either bit of information — thank you. The app then identifies your geo-location, conducts a quick voice-training/recognition, let you select your Google Home voice choice (male or female), and then the white dot LEDs go off: you're ready to go. The four white LEDs come on when you utter "Hey, Google" or "Okay, Google" – either work fine – to indicate its readiness to receive your command. Unlike Apple's HomePod and some Amazon Alexa speakers, you don't get an audible response to the wake-up phrase, which means you have to look at the Link 500 to get your query-ready cue. A white LED Wi-Fi indicator under the JBL nameplate remains illuminated unless its Wi-Fi network connection is lost. So, initial set up is silly simple, but JBL still should have included at least a "download app/plug in speaker/follow app directions" quick start guide for the uninitiated as it does for its Link 20. As with most Google Assistant speakers, the JBL Link 500 incorporates Chromecast, which allows you to build and control a whole-home audio system with any speaker wired to a Chromecast accessory ($30). "Easily set up your system and control multi-room playback with the Google Home app. A step-by-step guide allows you to quickly start streaming your music." Really? After a few minutes of filling through the Google Home app menus, I found nothing. I finally did a Google search, and found these handy instructions for setting up a multi-speaker group. I could have saved all this searching with a simple manual. Inside the Link 500 are twin 89mm woofers. By comparison, the Google Home Max actually sports larger woofers (114mm) but they're enclosed so they don't produce the Link's 500 palpable bounce. The JBL Link 500 outputs a total of 60 watts, more than any other smart speaker for which we have specs. (Google doesn't list any audio specs for its three Home speakers). 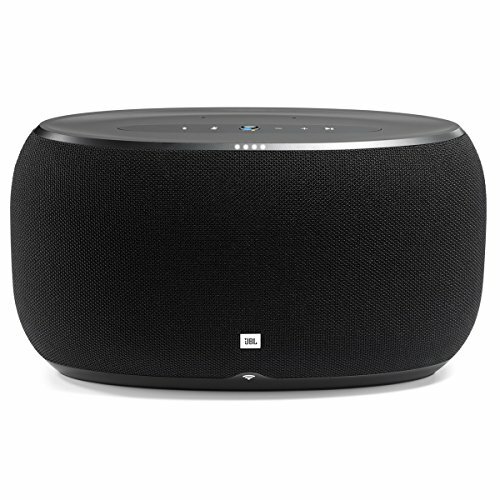 What makes the JBL Link 500 unique from other tabletop Bluetooth speakers such as the Google Home Max, smart or dumb, is a rear 4-inch woofer disc, ridged like a vinyl record with concentric grooves, that visibly vibrates and thumps to the beat. While the speaker faces away from the listener, just knowing that rear plate is bouncing around makes the bass it produces seem more, well, bassy. As noted, Link 500 is essentially a speaker version of Beats headphones, designed to accentuate the boomy bass of modern hip hop, rap, R&B, and EDM played loud. At its highest volume, measured from around 10 feet away, the Link 500 pumped out around 85dB of sound. But the real test for any speaker is how well it sounds at lower volume levels, and the JBL Link 500 fails this exam. Even at 50 percent volume, the speaker is still surprisingly muted. It's not until you turn it up to around 60 percent that music is worth listening to, even for genteel, music-with-dinner or conversation background situations. It's not until you turn up the volume that tunes come alive. Once turned up, there's nothing necessarily bad about JBL Link 500's music reproduction. But for pop, soft jazz, soul, older rock, classical, new age, etc., pickier discerning ears will consider the sound of the JBL Link 500 a bit flat with a shockingly narrow sound stage, lacking the vocal and instrumentation verve and placement specifics you get from more audiophile smart speakers such as the Amazon Alexa Sonos One or the Apple HomePod. No, the JBL Link 500's playback strength lies not in reproducing subtle sounds, but in pounding out more muscular musical fare pumped out at high volume. You'll also get better room-filling results if the JBL Link 500 is placed in or near a corner. But, regardless of how many decibels the JBL Link 500 pounded out, it almost never failed to hear my half-shouted "Hey, Google!" request. As noted, the JBL Link 500 connects over both Bluetooth and Wi-Fi, which is fortunate because the music services you can voice command to play over Wi-Fi is limited, and include either pay services such as Google Play Music (the default service), YouTube Music, Napster (Rhapsody) and 7digital Music, or the limited free or subscription versions of Pandora and Spotify. Under "Services with limited availability" in the Google Home app is Apple Music, but I couldn't figure out how to access my account. Again, a manual would've been handy. If you want to play your own music, you have to pair your phone and stream music to the JBL Link 500 the old-fashioned way – by Bluetooth, which you have to do separately, in addition to adding the JBL Link 500 to Google Home. Unfortunately, Bluetooth, which imposes its own additional compression scheme to already compressed tunes, noticeably reduces JBL Link 500's already middling medium-volume musical reproduction of non-beat-heavy tunes. Bottom line: to get the best performance from the Link, you'll need to subscribe to a compatible streaming music service, and turn it up. The JBL Link 500 is best as a single all-purpose speaker for a large space such as a dorm room, patio (as long as it's not exposed to moisture) or basement/party room, to play modern bass-heavy music. Fans of softer sounds and older tunes will find the Google Home Max sonically smoother, and a smaller speaker, such as the Google Home or the Link 10 or 20, more appropriate for occasional background accompaniment in smaller spaces. JBL also loses a few points with me for the Link 500's lack of auxiliary jacks, especially a USB plug to charge your phone. But for hearty gyrating partiers, the JBL Link 500 is the baddest beat producing room-filling smart speaker extant.